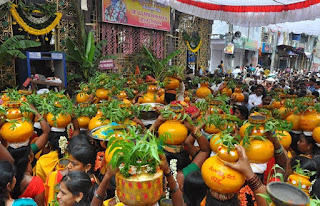 The Telangana culture, traditions and folk arts came alive with groups of women decked up in their finery celebrating ‘Bonalu’, ‘Bathukamma’ festivals. ‘Du du basavanna’, the caparisoned bull taken round houses during ‘Sankranti’, the ‘Gondu’ dance with their typical costumes, the decorated bull, for the ‘Sadar’ organised during Deepavali, enchanting ‘Oggu’ musical instruments, ‘Sadhana Shurulu’, a group from Karimnagar performing amazing and unbelievable native tricks, two ‘alams’ reflecting Moharrum (Peerala Panduga) and so on. There was a feast of ethnic Telangana cuisine starting with ‘Ambali’, a healthy porridge. “Not many in cities are aware of Telangana cuisine, turning as they are to processed food. It is time to reintroduce them,” said Mr. Dattatreya. As many as 22 items ranging from ‘jonna rotti’ ‘makka rotti’ ‘pesara garelu’, ‘sarava rotti’, prawn fry, chicken fry, ‘pacchi pulusu’, ‘challa charu’, ‘gudalu’(boiled channa), pappu, ‘boti’, mutton fry, sweets ‘malida’ ‘pasham’ and many more comprised the generous spread. Mr. Dattatreya said the aim behind the celebration was to remind every one about the uniqueness of Telangana culture and the need to respect it and preserve it with its own identity.